I am sure your inbox and the magazines you peruse and the TV programs you watch have been saturated with commentary on Brexit, much of its speculative nonsense. What I find the most annoying are people who feel that the British have made a huge mistake and that they are going to have to go through a period of unmitigated pain as punishment for their not appreciating the wisdom of their elders. They express an almost joyful glee in that prospect – especially if they don’t live in the United Kingdom. As Donald Rumsfeld more or less said, there are things we know and things we don’t know and things that we can’t even imagine. Brexit falls into all of those categories. So before we start speculating ourselves, let’s take a trip down Reality Lane in Europe. Then, after we have, I will offer a few of my own … speculations. What may surprise people is that I see a trend developing (admittedly it’s still nascent) that could actually mean that Brexit helps the European Union to come together in a more realistic and workable manner. Whatever – it won’t be smooth sailing. Before we turn to Brexit, we need to look back in time. Just 102 years ago, on June 28, 1914, Gavrilo Princip assassinated Archduke Ferdinand of the Austro-Hungarian Empire. We now mark that date as the beginning of World War I.
Europe was relatively peaceful in 1914. The bond markets certainly weren’t predicting trouble, as they were stable across the board. And even when it developed that countries were actually going to war, young British soldiers were very worried that by the time they were trained and got to the front, the war would be over. At the time, World War I didn’t have a number. It was simply the Great War, which quickly developed into the most horrendous war Europe had ever seen – and Europe had seen plenty of wars over the centuries. Some called it the War to End All Wars – but it didn’t do that. An even greater war was in store for Europe two decades later. I review this history for a couple of reasons. One is to point out how fast the world can change. By 1916 the Great War was a full-blown horror show. The other reason is to point out what happened after 1945. The Continent was in shambles, millions were dead, and no one wanted to fight ever again. The agreements that would evolve into today’s European Union were designed, in part, to prevent another and potentially even more disastrous European war. The thinking was that nations bound together economically would have less incentive to destroy each other. No one alive today saw the blood spilled at the Battle of the Somme in 1916. If we had, we would gladly do whatever is necessary to prevent another such massacre. We should recognize that, however badly the EU experiment may have gone off track, the EU grew out of noble and necessary motives. Europe must preserve positive intentions, before all else, as it reconfigures for a different kind of world. The United Kingdom’s vote to exit the EU was in no way a vote for war, but it still represents a major change afoot in the European political and economic order. Yet the reality is that change was already underway in countries all across Europe. Europe is a minefield of potential change, and the United Kingdom was just the first mine to go off. In the pages that follow, we’ll tiptoe into that minefield and think about how Europe might get through it. The good news: I think there are several feasible paths to the other side. Furthermore, the European leaders who will decide which way to turn aren’t stupid. Nobody wants to step on a mine. But in the process of getting through, they will sometimes be one small step away from going boom. Inches (or centimeters, if you prefer) matter when the slightest misstep can kill you. Europe was already well into the minefield before the Brexit vote. The UK’s decision may have made a bad situation more volatile, but Europe would still be in a fix if “Remain” had won. If Remain had won, refugees from Africa and the Middle East, many with the UK as their destination, would still be struggling across the Mediterranean or taking land routes into Eastern Europe. The EU would still be desperately trying to stem the tide and to accommodate those whom it can’t stop. If Remain had won, thousands of refugees would still be dying as their rickety boats capsized and sunk. If Remain had won, Greece would still be chafing under EU-imposed austerity as its economy endures depression-like conditions. Spain and Portugal would still be wondering if they are next. If Remain had won, Poland and Hungary would still be fighting against EU mandates that disrupt their internal affairs. If Remain had won, several EU governments would still be engaged in deficit spending that exceeds EU guidelines, while the EU’s inability to stop them continued to expose its inability to enforce its decisions. If Remain had won, the European Central Bank would still be holding interest rates below zero, buying private assets with public money, and propping up insolvent banks that must fail if the Eurozone economy is to ever recover. If Remain had won, Russia and NATO would still be facing off in the Baltic Sea, forcing already stretched governments to boost defense spending. If Remain had won, ISIS-sponsored or ISIS-inspired terrorists would still be plotting attacks like the ones in Paris and Brussels. If Remain had won, border checks would still be in force within the supposedly free-travel Schengen zone countries, making one of the EU’s greatest achievements into a mockery. If Remain had won, sizable minorities or even majorities in other European countries would still be agitating for their own exit opportunities. Catalonia would still be trying to separate from Spain. The Lega Norde in Italy would still be agitating for Northern Italy to secede. The Walloons and the Flemish would still want to sunder their ties with Belgium. Marine Le Pen would still be gaining strength in France. If Remain had won, the Supreme Court of Austria’s ruling that an extremely close presidential vote must be taken again would still stand, opening up the possibility that a far-right-wing party might take control of a major European country. The frustration over immigration and immigrants is growing. Nationalism, as opposed to loyalty to the European Union, is a rising tide that shows no sign of receding. If Remain had won, Italian banks would still be down some €400 billion, an enormous proportion of Italy’s GDP. German banks would still be teetering. I’ve written about both before. What I haven’t mentioned is how desperate the situation is becoming for European insurance companies, which are even larger than the banks. Arguably, many are in worse shape in a negative-rate regime. If Remain had won, the growing criticism of the ECB would still be growing, and negative rates would still be distorting European financial markets. Europe already faced a whole host of serious problems before the Brexit vote. It has done perilously little to resolve them and could yet make some of them worse. The EU routinely takes years to achieve consensus, even on trifling issues. It did not need another challenge. But it has one anyway. The Brexit victory surprised many people. I didn’t have a firm expectation either way, though the populist tide rising in many places around the globe convinced me that the Leave side had a good shot. What did surprise me was the 52%-48% margin. I keep seeing the vote described as a “big” victory for Leave. Was it? I’m not so sure. We would be having an entirely different conversation right now if a few more than 2% of the voters had gone the other way. That’s not what I would call a dramatic difference, at least on the national level. The margin was much more lopsided in certain areas like Scotland, which went heavily Remain. The conversation might be different, too, if the youth turnout had been higher. Voters under 25 went decisively for Remain – but most of that age group didn’t vote at all. There were lots of stories about young people complaining about the vote, but they shouldn’t be complaining about older people’s leanings; they should be complaining about their cohort’s not voting. We should also note that the Brexit vote very nearly didn’t occur at all. David Cameron made a terrible mistake by promising a referendum if his Conservative Party took control in 2015. He did win, so of course he had to deliver, but his original promise was to allow a vote by 2017. He could have delayed another year or more. The outcome might have been the same, but at least he would have had more time to make his case. As it happened, the whole process unfolded very quickly. Cameron announced the referendum date on February 22, so Brexit went from “unlikely” to “certain” in just four months. It’s a good reminder of how fast the world can change. I spent considerable time last week discussing Brexit with my good friend George Friedman of Geopolitical Futures. If you haven’t done so already, check out his Monday This Week in Geopolitics letter and the Outside the Box Special Edition I sent on Tuesday. George’s opinion is invaluable to me because he is the most dispassionate person I know. He analyzes geopolitics by looking at facts and following them wherever they lead. George is no one’s cheerleader or nemesis. He calls the shots exactly as he sees them, and he’s usually right. As for Brexit, George says it is the logical consequence of the European Union’s decisions in recent years. Some country was going to take this step. As it turned out, the UK was first, but it would have happened somewhere eventually. George also excels at distinguishing between political posturing and actual messages. He was not at all surprised to hear the EU bureaucrats in Brussels instantly take a hard line after the vote. Of course they say they’ll treat the UK harshly. Bureaucrats, and especially those of the EU Commission, always resist when someone tries to escape their grasp. The important point to remember is that the EU Commission, which is the executive body that implements policy, is not in charge of the EU. The leaders of the member states, collectively called the European Council, are the real power. (Europe is a hodgepodge of governmental authorities. You need a cheat sheet to know who is doing what to whom.) And within the European Council is a smaller group of powerful states that usually get their way. Their opinion is what counts. So what did they think of Brexit? But that wasn’t the end of it. The full European Council met to discuss Brexit on Wednesday, with the UK’s David Cameron leaving the meeting early as the other 27 countries pondered their next moves. Their statement reads much like the earlier one from the EU 6. Here is the key part, again with my bold highlights. 5. The outcome of the UK referendum creates a new situation for the European Union. We are determined to remain united and work in the framework of the EU to deal with the challenges of the 21st century and find solutions in the interest of our nations and peoples. We stand ready to tackle any difficulty that may arise from the current situation. 6. The European Union is a historic achievement of peace, prosperity and security on the European continent and remains our common framework. At the same time many people express dissatisfaction with the current state of affairs, be it at the European or national level. Europeans expect us to do better when it comes to providing security, jobs and growth, as well as hope for a better future. We need to deliver on this, in a way that unites us, not least in the interest of the young. 7. This is why we are starting today a political reflection to give an impulse to further reforms, in line with our Strategic Agenda, and to the development of the EU with 27 Member States. This requires leadership of the Heads of State or Government. We will come back to this issue at an informal meeting in September in Bratislava. Strip away the banalities and we again see the EU leaders recognizing how the game has just changed and acknowledging that they need a different approach to governance. The conclusion of the statement is important, too. They will “come back to this issue” in September. What happens between now and then? Probably a series of informal, closed-door meetings among the members. Factions may form as they each set priorities and seek allies. We’ll probably hear a lot of conflicting rumors in the coming weeks, but the important point is clear: Brexit changed everything. Formerly settled issues are back on the table. They won’t be resolved next week or even next month. The resulting uncertainty won’t be good for markets, but I think it’s likely the situation will fall off the front pages as the media move on to other stories. We have two political conventions coming up in the US, for example. That will take the spotlight off Brexit for a while. That being said, pay very close attention to whether it is the EU Council or the EU Commission that gets to take the lead role in negotiating with Britain. This point is already the subject of a very acrimonious debate in Europe. If the Commission (basically the Brussels bureaucracy) wins, they will want to punish Britain. If the EU Council gets the right to be the lead negotiator, they will want to try to figure out a way to make it all work, especially trade and commerce. The lawyers from both sides are arguing forcibly that it’s their team that should be responsible for the negotiations. This is a legal battle with real consequences. While the other 27 plot their next moves, the UK will be dealing with its own leadership vacuum. David Cameron’s resignation set off a frenzy of activity within his Conservative Party as well as the opposition Labour party. This New York Times story explains some of the parliamentary maneuvering. It is a mess. One scenario would involve Cameron’s party having to vote no-confidence in itself. There have been several people that have thrown their hat in the ring, but notably Boris Johnson made it clear he was not running. It is also clear that he would like to be prime minister some day, but (my speculation) knows that whoever actually is tasked with negotiating with the EU is likely to make everyone mad, because any ultimate resolution is going to require numerous compromises. He doesn’t want to appear to be compromising. But the compromise required for resolution ultimately means everybody’s ox is going to be gored a little, or maybe even a lot. Given the nature of British politics, being associated with this agreement, unless we see some miraculous changes of heart all around, is not the material from which a long-term residence at 10 Downing St. is gained. In any case, someone will eventually become prime minister and have to deal with Brexit. Whoever it is will face the same fundamental reality as the EU. Neither side can afford to sacrifice trade with the other. Germany in particular must maintain free trade with both the UK and the rest of the EU. That part is non-negotiable. Exports account for around half of Germany’s GDP. This is already presenting challenges as economic weakness reduces sales to China and the rest of the EU. If barriers go up to reduce trade with Britain and the US slips into recession (which I think is quite possible in the next year or two), Germany will have two very serious problems. First, unemployment will rise and tax revenue will fall, stretching the country’s social insurance programs. Second, unemployment will rise in other states that trade with Germany, sending workers from those places to what will still be the EU’s strongest (or least-weak) economy: Germany. And Germany can’t very well complain about the influx of foreigners at the same time it scolds the UK for resisting foreign workers. How that situation will sort out is anyone’s guess. The German economy is an industrial export machine, one of the best in history. That’s great as long its customers keep buying – and a huge problem if volume dries up. China is dealing with shrinking export volumes right now. Germany will face a similar challenge soon. This is why, whatever Angela Merkel says for public consumption, I expect her to be very flexible in dealing with the UK. To this point she and the other EU core have tried to hold a hard line, threatening dire consequences for the UK as a signal to other potential defectors. Tough talk isn’t working, and I think they now realize that tactic won’t ever work. Merkel, or indeed anyone who might take her place in the coming years, is in a box. Germany must keep the export machine running. That means preserving free trade with every large market in the world, including the UK. Germany will sacrifice whatever it takes to accomplish this. The result could be a very different Europe a few years down the road. But other problems will pop up first. Italian banks have a big problem: something like €400 billion in nonperforming loans. Imagine a much larger version of Greece (in terms of total government debt and banking problems) only a few years ago, and that’s Italy. The Italians have successfully extended and pretended for years, but working that magic gets harder every day. With the banks, government debt, the refugee crisis, and now Brexit, Italian Prime Minister Matteo Renzi has his hands full. The EU’s harsh demands haven’t helped. Do you remember the Cyprus bank crisis back in 2013? Italians do. They saw EU authorities enact “bail-in” arrangements that forced large depositors to take haircuts on their accounts. For Americans, recognize that the EU has no central deposit insurance comparable to our FDIC. They consider deposit insurance a responsibility of each nation. EU rules prohibit members from bailing out banks with taxpayer money and practically force bail-ins. This is just the beginning of accommodation in Europe. New Europe, new rules. Given the two public statements above by the EU Council and then the unusual banking relief given to Italy in the space of a few days, it is obviously beginning to dawn upon European leaders that, if they want to hold it together, things are going to have to change. A few more comments on Italy. Italian GDP is around $2 trillion. At today’s exchange rate, Italy’s nonperforming bank loans total roughly 25% of GDP. Compare Italy to the US, where nonperforming loans amount to only 1.2% of GDP, or $128 billion. If nonperforming loans in the US were 25% of US GDP, they would amount to an astronomical $4.5 trillion. In reality, €190 billion is a Band-Aid over a major gash, one that is still bleeding and getting bigger. But that Band-Aid will get Renzi through the next election, and he (along with institutional Europe) hopes that he gets the mandates he needs to start the long-past-due reforms that Italy will require to pull itself back from the brink. If he doesn’t and the Five Star Movement maintains the momentum it has achieved in the regional elections, the ball game will change. Or at least there will be new players on the field, contending with the same problems. The reality is that much of the assets against those nonperforming loans will end up being like the homes that were pledged against subprime loans. Once the cascade starts, the underlying value of the assets plunges and the number of nonperforming loans swells, perhaps dramatically. I’ve written about this domino effect before and used a colorful map to visually demonstrate that the large majority of the nonperforming loans are in Southern Italy. Italy is one good global recession away from a major crisis. But now that the ECB has decided that it can use the funding mechanisms created in the last crisis, it will be able to print the money, piling the resulting debt on the back of all of Europe. Then, of course, there will be Spain or Portugal or whichever domino falls next. That brings us to one of the most dangerous parts of Europe’s minefield: France. Last week my friend Ben Hunt of Salient Partners made a fascinating and scary point on his firm’s Brexit conference call. Ben thinks Brexit is comparable to the Bear Stearns collapse in March 2008. At the time, Bear was thought to be the main culprit in the subprime mortgage meltdown. After months of drama, the firm’s big hedge fund clients started withdrawing money – enough to render Bear illiquid. The Fed stepped in, essentially executed Bear Stearns, and handed the corpse to JPMorgan Chase. Everyone then breathed a huge sigh of relief, thinking the Fed had done its job and the crisis was over. Markets recovered somewhat, and all seemed well. Six months later the second shoe dropped when Lehman Brothers was allowed to collapse, and then AIG and Merrill Lynch all got “resolved” at enormous cost. If Brexit is like Bear Stearns, then we can expect a calmer period just ahead – followed by another, bigger calamity. Ben thinks it will happen in France. Opinion surveys show the French are at least as unhappy with the EU as the British are, and possibly more so. They will have a chance to express their discontent in their presidential election next April. So, the interval before the next shoe drops may be longer than six months, but Europe is always slower. Socialist President François Hollande has not yet said whether he will stand for re-election (he wouldn’t even make it into the runoff), but we know Marine Le Pen of the National Front is running. She has a fair shot at winning, too. If she does, a National Front victory would be a thunderbolt at least as serious as Brexit. Le Pen congratulated the Brexit voters in a New York Times op-ed last week, at the end of which she summarized her own manifesto. I’ll quote her at length because what she says is so important. In particular, pay attention to what she says about Merkel and Germany. Austria came within a hair’s breadth of just electing what is, for Europe, a far right-wing party, which means it is something that would be familiar to many Republicans here in the US, with a few glaring exceptions. The two finalists in the recent election were from the Green Party and from the Freedom Party of Austria (FPO), the top finishers in the first round of elections. Both trounced the traditional parties. Even though the FPO was the clear leader in the first round, the entire establishment of Austria fled back to the Green Party, which eked out a very narrow victory at 50.3% to 49.7%. The FPO would have been the first such right-wing party to win in Europe. And now the Austrian Supreme Court has invalidated the election and has told the parties to go back and have another election. This is one to watch. In Holland, Geert Wilders’ Party of Freedom is currently topping the polls, and in Germany the anti-Islamic Alternative for Deutschland (AfD) has caused Angela Merkel, the German chancellor, to warn of a return to nationalism. Establishment politicians across Europe will look at a FPO victory in Austria, and many will be very afraid. They should be. I began this letter by recalling the Great War between France and Germany. Geography and history have pitted the two nations against each other many times. And if it wasn’t Germany, then it was England or Spain or one empire or another going back for 1000 years. The EU’s greatest accomplishment was to break that cycle. I am not at all suggesting that France and Germany will go to war. I see no chance of that. What I do see, though, is bad enough: Marine Le Pen portraying the EU as a threat to French liberty and prosperity, with Germany acting as the EU’s puppeteer, and a substantial part of the French population agreeing with Le Pen. The problem is, there is a ring of truth to what she says. I have readers in every country in Europe; it’s not my place to take a side here. As an outside observer, I see a level of frustration and antagonism that is reflected in the US and certainly is evident in England. Unless this frustration is addressed, it will not help the post-Brexit EU rebuild itself into an alliance that can handle Europe’s many challenges more effectively. We should not underestimate the EU’s ability to postpone the inevitable. They’ve done it far longer than I thought possible seven years ago. Maybe they will again paper over the unpleasant disagreements and buy a few more years. Yet I think hanging on is getting harder for them. We may in fact be near the big turn. 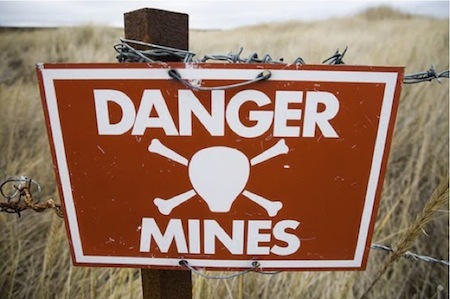 The minefield we’ve talked about has a very narrow path through to safety. Europe is just now taking the first hesitant steps on that path. Any misstep will have appalling consequences. I actually view Brexit as potentially quite positive, as it offers the opportunity for a reset along lines that are more realistic. To see the EU Council move as rapidly as they have to acknowledge the problem – something they would not have done without the vote in the United Kingdom – actually sparks a little bit of hope. For the last 17 years, the EU has tried to make the old agreement work when it clearly doesn’t. Now that EU member nations know what doesn’t work, maybe they can design something that looks more like a trade union, with some additional characteristics that don’t impinge too much upon national identity – and maybe they can acknowledge the problem with immigration and borders (don’t even ask me how that gets solved). That would be an EU far different than we see today. Forging it will require a completely different vision of the future than what we have seen in both the founding and the running of the current EU. Brexit was a wake-up call. The first few steps of the EU Council have been in the right direction. Now they have to rework 10,000+ pages of agreements, with bureaucrats fighting every inch of the way, trying to maintain their control. The task is daunting, and it’s not altogether clear that they can pull it off. We are told by every twelve-step program that the first step in solving a problem is to acknowledge the problem. Until two weeks ago, that had not happened in Europe. Now it has, so all we can really do is wait to see if there is the willingness for step two. As I said at the beginning, there will be no end of rumors and personality clashes and trial balloons. First, let me remind you that the offer to buy the audio replay and transcripts from my recent Strategic Investment Conference will go down in a few days, so if you have been meaning to get them, don’t procrastinate. You can find the link here. I know, I said I wouldn’t leave Dallas until I finished my book; but Mark Skousen talked me into coming to his big libertarian blowout in Vegas, called FreedomFest. Since I’m not really doing a vacation this summer, I thought I could go and moderate a few panels with old friends like Steve Forbes and Rob Arnott. I have tons of friends coming to the conference, and I’ll also do a breakout speech that I’ve have been wanting to do for quite some time but that I know nobody will pay me to do, entitled “The Invisible Hand, Evolution, and Why I Am an Economic Atheist.” It will be a short speech on a topic I have thought about a great deal and am passionate about. For the last 10 years, the first Friday of every August has found me and my youngest son, Trey, in Grand Lake Stream, Maine, for what is now affectionately known as Camp Kotok, after David Kotok, who founded the annual the event many years ago. It is a gathering of economists and financial types, along with their friends, who spend three days talking economics and politics, sharing stories, fishing, and drinking. I will leave from Maine on Sunday and spend the next few days in New York doing media and some meetings. The last few weeks have been rather emotionally stressful for me, with family and business issues to work out. I often talk about countries that are left with no good decisions, but we all know that sometimes that happens in our personal lives as well. Yet you have to make a decision and move on. The reality is that very few people (and that includes me) would feel all that sorry for me, as my life is really quite good, with just the odd bump here and there that is part of the human condition. If you have seven kids, there’s going to be a little drama every now and then. But then Dad gets it sorted out (or maybe he gets himself sorted out), and things return to normal. I have to remember that, as I am still in the sorting-out phase. In any event, there will be a smallish gathering of friends, neighbors, and family for barbecue and watching fireworks from my apartment on the Fourth. Year before last we actually saw 12 different fireworks displays around the region from the balconies. Admittedly, some were 15 miles away, but it was still fun to watch, especially the much closer ones. Stay safe, enjoy the holiday, and have a great week! July 5, 2016, 9:22 p.m. I recall reading here that the purpose of the European Union and the coincident adoption of a single currency was to insure that French and German exports remained affordable to their European trading partners. In addition to the popular discussions of immigration and other social and political issues, the crux of an EU breakup is what happens currency-wise. Ostensibly if the weaker economies secede, their currencies will fall. Their exports will become more affordable to stronger currency buyers, but the cost of imported goods will skyrocket. Additionally, but by no means less important is how debt gets repaid. Weak currency debtors tend to fare poorly in times of stress. July 5, 2016, 6:46 a.m. The referendum result was not as close as it seemed if you look at the Scottish tactical voting’. 40% of the electorate are Nationalists. They were actually voting for something quite different to the question on the polling card. Had that 40% divided in the same way as England and Wales the result in Scotland would have been more for Leave than the UK national average. The reason London was so out of kilter with the rest of England and Wales is also worth a second look. London (and the capital Cities of the EU) particularly benefit from EU membership. There lie the seats of government, the head offices of the mega-companies, the financial centres and the strongest magnets for immigrants. These influences are particularly strong in London’s case. The London metro, fat cat’s have done disproportionately well out of the EU. There was elitist group-think in London. Their disconnect with the rest of the country is why the markets got it so wrong. July 4, 2016, 2 p.m. I can see where capitulation on hardball techniques and positions can help keep the EU together but I think “different levels of ambition” may get much more broadly interpreted as we see already with Italian bank relief. Maybe the word insolvent is written with a pencil eh? Jocularity aside, I don’t see how increasing EU wardship works in the long run either now that EU nationalisation seems forever off the table, however remote it was before. I can also see where the “Six” have no other option at the moment; that was one hell of a playing card Brexit threw out to the rest of the EU members. Go Fish! July 3, 2016, 9:12 p.m. Slaughter is a feature to almost every battle and “no one wanted to fight ever again” is a truism in the aftermath of every war. Present These as real motives for the European Union Project is laughable. customs of so many nations. Despite those risks the project went ahead anyway. So the EU Project were not designed, not even in part to prevent another war. EU Project as a War avoidance strategy is a propaganda story to gather sympathies from the populace for the monstrosity that the European Union project was to be (and the leaders knew or at least sensed that). Mr. John Mauldin unfortunately bought that blind. The Eu Leaders also employ aggressive propaganda tactics like spin any argument against the EU as a nationalist, bigot a and even racist point of view. The relentless negation of legitimacy of contradictory views, a sure sign of the autocratic dictat nature of the Eu Technocracy in the name of their global industrial masters. gives the name to the “Monnet method”. structures. Suddenly voila the nations sovereignty succumbs. (sanction, isolations, and even brute force if necessary, is implied). dependent on the industry and cannot survive by itself. trade and free commerce (not so free since hubs of trade are to be dominated by huge economic scaled oligopolies). Law, Jurisprudence and Regulation without destroying cultural identity. Remaining for the citizens a life of artificial consumerism, alienation and psychological misery. Like Marine Le Pen very apropos said in the op-ed cited in this article the EU turn out to be a modern version of the Procrustean bed. A homogeneity facelessness for its citizens and a Steam Roller on the rich, diverse cultural legacy of several thousand years. July 3, 2016, 5:45 p.m.
July 3, 2016, 5:20 p.m.
July 3, 2016, 4:05 p.m. I agree that the next steps in Brexit are unpredictable, but I think John is overlooking several complications in the process. * Leaving starts when the UK activates article 50 of the Lisbon treaty. The process will take up to 2 years. The EU wants the UK to activate article 50, ASAP. The 2 likely next PMs (May and Gove) have stated that “formal talks triggered by the activation of Article 50 would not start before the end of the year, in spite of impatience in Brussels.” The Article 50 2 yr process is to negotiate the terms of separation — basically ending the obligations and responsibilities that stem from being an EU member. Can it be used to agree on a new trade deal? No. With the explicit consent of German chancellor Angela Merkel, a sentence was unexpectedly added to the statement on Wednesday (which John seems to have missed) saying “access to the single market requires acceptance of all four freedoms”, a reference to EU principles on the free movement of capital, labour, services and goods. And, a trade agreement with the UK will require unanimous approval of all EU members (via their parliaments and possibly referendums in some countries). Do you really think that any of the Eastern European parliaments will agree to restricting free movement of labour? And, it takes just one to prevent a trade deal. The UK’s overall trade balance is negative (i.e. it imports more goods than exports). This negative balance is 5-6% of GDP. About 53% of UK imports come from EU countries, and about 45% of UK exports are to EU counties. Germany (in the EU) is the largest UK trader (both imports and exports). It is in the interest of the UK and its largest EU trade partners to get to a trade deal. BUT all the EU countries must agree on a new trade deal. This will be difficult and take a lot of time. Since almost all trade deals with other countries outside EU are with the EU, the UK must also negotiate new trade deals with these as well, e.g. the USA and China. Seizing the chance offered by Brexit, French president François Hollande said the eurozone would repatriate the clearing of euro-denominated trading from the City of London, claiming the current situation was “exorbitant” for France. “As soon as the UK is not part of the EU, there is no reason that this continues,” he said. The European Central Bank is preparing to resurrect its so-called “location policy” on clearing houses, according to officials — a move that had been thwarted by the UK after a four- year battle through the European courts. * Bottomline: Put yourself in the position of a CEO of a multinational company with manufacturing and sales in various EU countries. Suppose you need to grow your manufacturing? Will you do it in the UK? Suppose instead you need to cut costs, eg close some plants? Which countries will you consider for this downsizing? If a UK employee for such a company would now save or spend? My Guess: Theresa May, a moderate, will be the new PM (she is the current favorite, and Gove, a neocon, made too many enemies, e.g. his Brutus-like action of BoJo). Although she says that she will lead the UK out of the EU. This won’t happen. She will try (but fail) to engage the EU before giving article 50 notice. But this is just a delaying tactic. Britain will enter a recession. She will wait for a groundswell of support to stay in the EU. There may be a new referendum, or simply an overwhelming majority in parliament to stay in the EU, i.e. the vote for implementing article 50 will simply fail. July 3, 2016, 3:28 p.m. The bank is battling to settle a number of regulatory probes — including into its mortgage-backed securities business and its Russian operations — and is also in the midst of a 5-year restructuring effort aimed at boosting capital and profits. In last year’s final quarter Deutsche Bank suffered a NET LOSS OF €6.8 billion. The warning from the IMF about Deutsche as a source of systemic risk also coincided with the failure of Deutsche Bank Trust Corporation in the Fed’s annual stress test. And this is the second year in a row in which the unit has fallen short.